B2B website design presents a unique challenge. A great site requires craft and creativity, as well as a deep understanding of the business and industry. Symmetri meets this challenge time and time again, building clean, modern B2B websites that are easy to navigate regardless of screen size and resolution. We build sites that help you stand apart from the competition while remaining true to your brand standards and image. 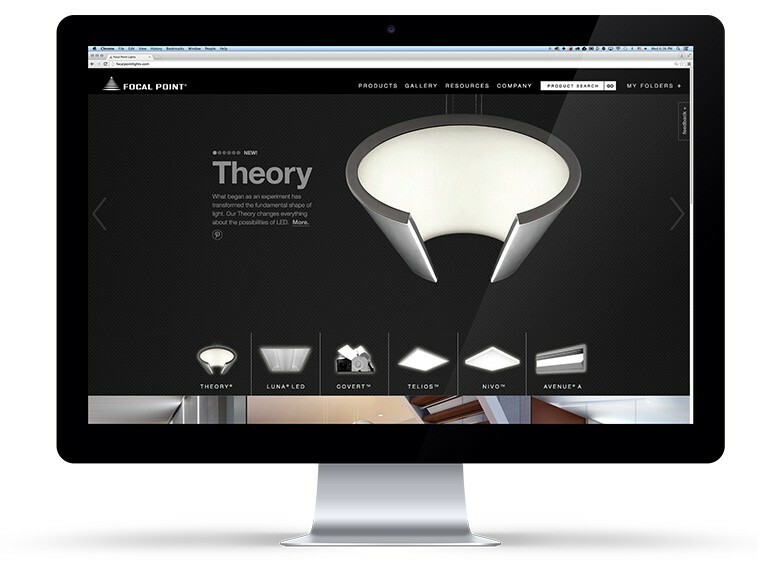 With architects and lighting designers searching for answers and assurances in the expanded technological world of commercial lighting, the unique nature of Focal Point’s business provided a chance to bring personalization to its site. Focal Point challenged Symmetri to inspire architects while making it easier to specify products. Visitors can now tag and retain favorite products and documentation in virtual folders, as well as send information to others straight from the site. New enriched search capabilities and intuitive, expanded product menus put even greater control in the hands of the user, reducing the need to use internal Focal Point resources for specification assistance. In the first two months after launch, the Saved Folder function was used more than 350 times, the Send and QuickSend Assets functions were used more than 600 times, and the Send and QuickSend Product functions were used nearly 900 times.